Olympic bronze medallist Laura Deas will be aiming for her first World Championship medal after being named in the British skeleton squad. Deas, 30, made history alongside gold medallist Lizzy Yarnold in PyeongChang, and will hoping for a podium finish in Whistler, Canada, on 7-8 March. The Welsh competitor is joined in the women's team by Madelaine Smith and Ashleigh Pittaway. The men's team is made up of Jerry Rice, Jack Thomas and Marcus Wyatt. Smith and Pittaway will both be making their World Championship debuts in Whistler. Another debutant, Wyatt, finished the World Cup season in sixth spot after a personal best fifth-place in Calgary on 23 February - his sixth successive top eight finish. Rice, an Olympian in 2018, will take part in his second World Championships having finished 19th in Konigssee in 2017. 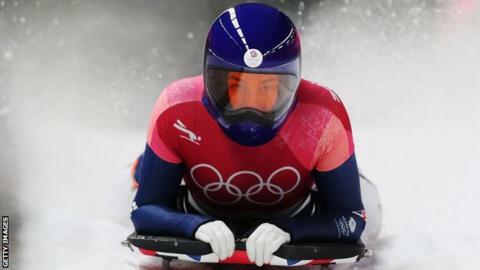 "The World Championships are the showpiece event this season and these six athletes have worked hard all year to earn selection," said British Skeleton's Interim Performance Director Natalie Dunman. "They've all stepped up this season in different ways and I'm confident they can do us proud in Whistler."